Given the number of hours in a work week spent sitting, including commuting time, it’s not surprising that many office workers suffer from at least one musculoskeletal (MSK) condition. Common workplace injuries include tendonitis/osis, carpal tunnel syndrome, back and neck pain, as well as neck/shoulder stiffness and circulatory problems. Pain and discomfort can be caused by maintaining a poor or static posture, repetitive movements, awkward work positions, and even excessive bending and twisting. Luckily, by paying attention to workplace ergonomics, you may be able to decrease the risk of developing many of these conditions or minimize the pain and discomfort. 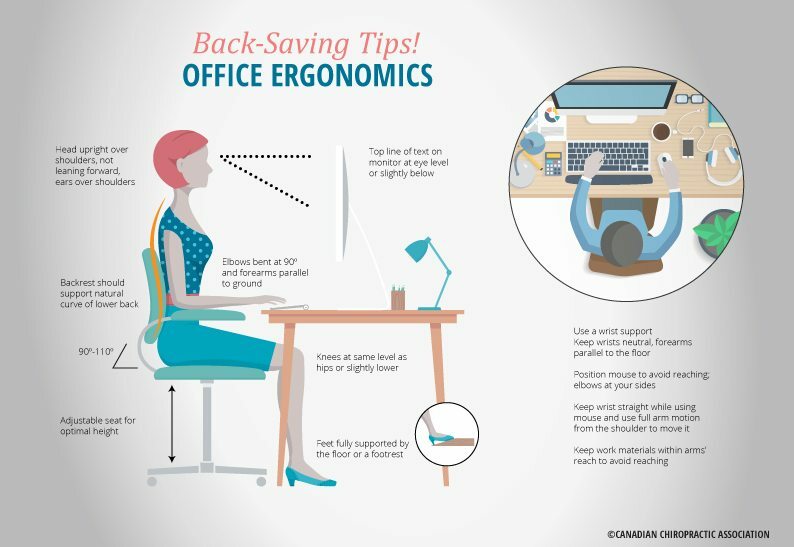 Check out the tips below to see how you can improve your office ergonomics and ultimately your health. Sitting too high or too low relative to your desk or computer screen can fatigue and even strain the muscles of the neck, shoulders, back and even legs. An improperly positioned backrest may cause slouching or shrugging, and increase stress on the shoulders and back. Sit in your chair so that your shoulders and lower back are resting comfortably against the back rest. The back rest should be adjusted to an angle of 90-110 degrees to provide adequate support.1,2,3 You may need to use a lumbar support pillow or rolled up towel to provide extra support to your lower back. The height and angle of the seat should allow for your thighs to be parallel to the floor with your knees in line with or slightly lower than your hips. Once you have adjusted your chair, check your feet. If they are not flat on the floor, use a foot rest to decrease pressure on the back of your thighs. The arm rests support your forearms and elbows, and it’s important that they are the correct height for your body. The height and viewing distance of your computer monitor are important considerations that could help reduce eye strain, as well as muscle tension/stiffness in your neck, shoulders and upper back. The top line of text on the screen (not the top of the monitor) should be at eye level. This helps to keep your neck in a neutral position while you work. If your monitor is not adjustable, stack stable books or other materials underneath the monitor’s base to raise it up. If the monitor is too high to begin with, raise your chair and use a foot rest to maintain proper posture. If you raise your arm to shoulder height and stretch it out in front of you, your fingertips should just reach the screen. The keyboard height should allow you to rest your arms (rather than reaching) with your elbows at your sides and your forearms parallel to the floor. Keep your wrists neutral and consider using a soft wrist support. 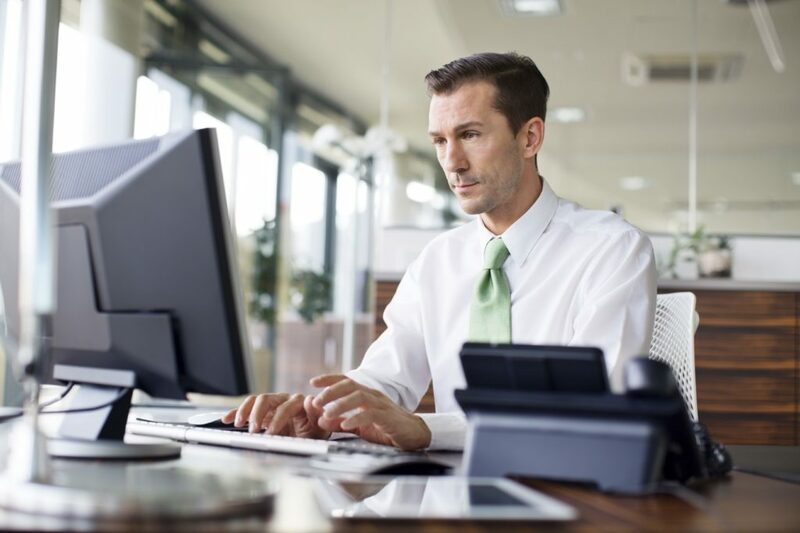 Position your mouse at the same height as the keyboard and as close to the keyboard as possible to avoid reaching. Keep your wrist straight and use your full arm to move the mouse from your shoulder. Don’t grip it too tightly and take your hand off the mouse when you aren’t using it. If you’ve incorporated the above tips into your workspace setup, you should also pay attention to your posture. Most importantly, make sure you sit comfortably with a neutral spine and take “movement breaks” at least every 50 minutes or so. As a reminder, you can set an alarm or directly schedule breaks in your calendar. Straighten Up Canada, the free app from Canada’s chiropractors provides quick, easy-to-perform exercises and allows you to set reminders so you never forget to straighten up. For more useful tips to help you beat back pain at work, check out our At Work resource. 1. “How to Make Your Computer Workstation Fit You” Worksafe BC, 2009.